Although we had already managed to look at a few things in Kobe yesterday, there was still much more too see! So today we tried to cram as many different things in as we could. In order to achieve this we made a fairly detailed plan of when we would go to each attraction. A bit of a problem we had with that though, was that most things did not open until around 9-10am and we wanted to get going at around 7:30-8:00am. Luckily there was one thing on our list that’s always open! The giant Tetsujin-28 Statue we had seen yesterday! So, after having a simple breakfast (cereal for Kate, conbini for me), that's where we headed first. Shin-Nagata station is located only a few steps away from the statue and three stations away from Motomachi which is the station closest to our hotel. After a brief wait, and a seven minute ride on a local JR Kobe Line train, we arrived at Shin-Nagata at around 8:00am. Tetsujin 28-Gō is a ye olde anime and manga franchise from the 50's and 60's featuring a boy and his giant robot who is named “Tetsujin 28” (鉄人28号= Iron + Person + #28). The show was so popular that is was adapted into English, where the robot's and show's name were changed to Gigantor. In order to commemorate the 15th anniversary of the Great Hanshin earthquake a giant 18 meter tall ‘life sized’ statue of the giant robot was built in 2010. The construction also aimed to honour the life of Tetsujin 28-Gō’s creator, Mitsuteru Yokoyama, who was born and grew up in Kobe and had recently passed away at the age of 69. Yokoyama’s other famous creations include Sally the Witch, Giant Robo and Babel II. The surrounding streetlights were themed! The Tetsujin-28 statue was built at a cost of 1.4 million dollars using funds from Kobe City, local businesses as well as private donations. The intention was to create the statue as a work of art in order to revitalise the area and help attract more tourists. Initially, when we arrived at Shin-Nagata station, we were not quite sure where to go to get to Tetsujin. However, we soon found a sign pointing the way, and walked over to the park that he was guarding! Wow! The statue was very tall and really impressive! Since it was still quite early in the morning, the area was pretty much deserted and all the shops were shut. The only people around apart from us, were some workers who were setting up tents for some sort of unrelated exhibition. Although this meant we had the good fortune to have Tetsujin-28 all to ourselves, we were actually quite embarrassed to make a fuss over him and pose for photos. Eventually we worked up the courage to take some photos, although unfortunately I couldn't convince Kate to mimic the pose! We spent some time admiring him, and before long it was time for our next destination, the Sorakuen (相楽園 = Mutual + Happiness + Garden) gardens. These gardens were actually located within walking distance of our hotel so we caught the train back to Motomachi. Once we arrived we walked part of the way a along really creepy corridor in order to cross to the northern side. This corridor/tunnel is part of the Piazza Kobe and Motoko town which is a really long arcade that runs under the JR railway lines all the way from Sannomiya, through Motomachi, to Kobe station. A massive variety of second hand goods are sold here and making it a good place to find a bargain. At this time early in the morning though, all the shops were closed and it was very dark! From Motomachi we continued north-west up a hill, past the Kencho-Mae subway station, and arrived at the gardens ten minutes later. Just before we reached the entrance gates, a massive amount of older Japanese people crossed our path on their way to the gardens! We were worried that they would all take ages to pay, so we managed to get a head of them and quickly payed to get in. It turned out though that they all had some sort of pass (season pass?) that they flashed at the ticket counter, streamed past us at high speed, before disappearing ahead of us. The gardens were actually quite busy in general as today was a public holiday in Japan (Culture Day); It definitely wasn’t too crowded though. The Sorakuen Gardens first opened to the public in 1941, before which they belonged to a former mayor of Kobe. Many of the gardens original buildings were destroyed in WW2 with only one of the old stables surviving. Apart from the stable, the Hassam House, which is another old building, currently resides in the gardens after it was moved here in 1961. While we were there it looked like there was some sort of flower exhibition taking place as there were heaps of flowers! They were set up as displays in the stable, other little enclosures and along the garden's paths. It looked like they were taking part in some sort of flower competition as some of them had signs saying they’d won the such and such prize. We first saw many differently coloured puffy chrysanthemums. Next was the bonsai section that had really cool miniature versions of different plants and trees. Following the bonsais were some small trees that had a heap of flowers growing out of them instead of leaves. There were also some other displays where the flowers were a ranged in heart or other shapes. It must be pretty hard to make sure all the flowers bloom all at once in these displays. This one received some sort of "Kobe Mayor's Prize"
They were all very impressive. After the displays we explored the rest of the garden. The garden was quite compact which meant that and all of it's the prettiness was condensed into one area. There was a lovely pond, a stream with some stepping stones, stone lanterns, small wooden buildings and a rock tunnel. On the other side of the tunnel there was a nice little covered bench where we had a little sit and relax. From the garden we could also see the big city buildings around the outside, which I thought helped add to the sense of calm amongst the bustling city. So far I've talked a fair bit about the garden’s flora, but let’s not leave out the fauna! Apart from the obligatory koi in the pond, there were also some interesting birds about. We had a very enjoyable time walking around and we both agreed that these Sorakuen Gardens were our probably our favourite Japanese garden of this trip. The Kobe Nunobiki Herb Garden was our next destination and are the largest herb gardens in Japan featuring over 75,000 herbs and around 200 different species. They can be accessed from Shin-Kobe station either by hiking up the mountain or by using the Shin-Kobe ropeway which carries you all the way to the top. Upon arriving at Shin-Kobe we started looking for the bottom ropeway station that’s located nearby. There were signs with arrows about the place although they were a little hard to follow; mainly because we were in two minds (me one, kate another) about whether or not we wanted to climb up the mountain first and get the ropeway down, or vice versa. I wanted to do the ropeway up first and walk back down as I thought it would take us too long, and would be too tiring, to walk all the way up the mountain. So we were trying to find and head towards two different locations at once. Since there were no signs pointing to the path up the mountains, we ended up at the ropeway station where we decided it’d be better to get the ropeway up and walk down. There were people and vending machines available to buy tickets from so we bought a one way ticket from one of the vending machines, as we generally preferred to use the machines if possible. One we got our ticket we lined up and got on the next gondola up the mountain! The ropeway was fun and since it wasn’t too busy we had a whole gondola to ourselves. On the way up we were treated to great views over Kobe and the ocean. Towards the top we came into the middle station which is located at the bottom of the herb garden. Inside, there was a lady guiding the gondolas as they passed through, and helping people if they wanted to get off. As we were coming up we could see her giving a pamphlet to the people in each gondola as they went past. However, when it was our turn she totally didn’t give us a pamphlet! It looked like it was a map and information sheet in Japanese about walks in the area and we would have really liked it. I guess she assumed that we couldn’t read Japanese and we therefore wouldn’t want it. Even if we couldn’t speak Japanese a map still would have been useful. It makes me think that it must be incredibly annoying to be a non Asian person actually living in Japan, maybe even born there, and have people constantly make decisions based on the assumption that you can’t understand Japanese. Anyway, we stayed on the gondola and continued up to the top station, as we wanted to walk all the way back down from the very top of the herb garden/mountain. At the top there was a largish main sort of plaza area with live music, some outdoor seats and a few shops. In one of the shops Kate bought some Jam and some rosemary flavoured biscuits. 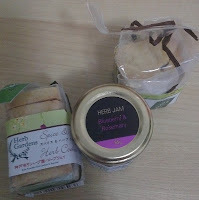 We couldn’t really try the Jam but we had a biscuit each and found that they were super delicious! They had few other flavours (rosemary, rose & rose hip, cinnamon, fennel) and we both went back into the shop to buy some more packets. I got another rosemary as well as a rose & rose hip and Kate bought another rosemary and a Fennel. Since it was nearly lunch I also got some fried chicken from a window that was selling chicken as well as honey and herb flavoured ice cream. I think the chicken had some herbs from the garden in it as well, it was really tasty! After lunch we had a look in a big building further back behind the plaza but didn’t find much inside- I think it was some sort of hall. Finally it was time to start walking down the hill and looking at some herbs! We followed a road down the hill before reaching a bunch of little herb gardens in a section off to the side. This area is known as the Herb Museum. Here we found a heap of different types of herbs, some of them looked familiar, but there were plenty of weird ones mixed in as well. Many I’d never heard of or seen before in my life, although that's not particularly surprising as I'm not much of a chief culinarian cook occasional burner of food. There was plenty there that were new to Kate though as well. At the Herb Museum we passed by some people who were being given a tour of the gardens in Japanese. Next up was the Herb Kitchen where we found a lot of different types of rosemary and a bunch of other herbs as well. We then left the main road and looped back around on a smaller path down to the greenhouses. The greenhouses were not too hot or humid inside but were very lush and had a lot of different flowers and plants on display. Some of the flowers were arranged into shapes like in the Sorakuen Gardens and we spent a good amount of time walking around, admiring the plants, and taking photos. Attached to the greenhouse buildings was a café, as well as other buildings where you could register for workshops to make bath salts, soup and pot puree. From the greenhouses we went back up the hill to look at the lavender garden before continuing back down to the Four Seasons Garden which was filled with many colourful flowers. Next was the Waterfall Patio which was a little water feature. On the wall there was an ant which I snapped a quick photo of for some reason; I think I was having lots of fun with the macro feature on my camera. We continued on from the patio by crossing the main road and walking down along the left side of the Oriental Garden before reaching the bottom where there was a large grassy picnic area, a fruit garden and the Kaze Oka Flower Garden. We had a bit of a rest on the grassy hill and admired the view over Kobe. The city looked to be nestled between the two sides of the mountain with Rokko Island and the Kobe Airport swimming in the bright shining blue sea beyond. Right at the bottom of the gardens, and just before the ropeway station, there was a little shop that sold more of the delicious herb biscuits! Good thing too, as I'd already munched through two packets on the way down! We both bought some more, after trying the Rose and Rosehip I decided I preferred the Rosemary, so went with two more of those. Cinnamon probably would've been really good too although as it's not that unusual a flavour we passed on those ones. After exiting the herb garden by following the path around the middle ropeway station, we turned left at a road and started making our way down to the Nunobiki Waterfalls which are known as one of Japan's three most holy waterfalls. We walked down the road a little while for a while before arriving at a path that led off the road and looked like it might lead down to the waterfall. We were not 100% sure it was the right path to take but since there was a far amount of people around we figured we couldn’t be too far off track. While we were walking along the path a lot of friendly people passing us by were saying 今日は or "Konichi wa" which, as I'm sure most people reading this know, means "Hello". I enthusiastically greeted them back! Eventually we ended up as some sort of small dam or reservoir which was quite pretty but not the waterfall we were looking for! So we turned around and walked back and, after almost going along a bridge down the wrong different path, found the waterfall! It was very pretty to look at and fanned out in an interesting way at the bottom. I didn't really think it looked much like a coat hanger though. As Kate was fond of telling me, apparently it supposed to look like a cloth, not a coat hanger. This is actually obvious if you look at the name: 布引の滝 = Cloth + Stretch + 's + Waterfall = NunoBiki + no + Taki. For some reason though, I had it stuck in my head that it was supposed to look like a coat hanger. And it did not look like one at all. It didn't really think it looked like a cloth either to me. Kate could see it though. Anyway! Whatever it did or didn't look like it was still very pretty. Once were done with the waterfall we walked past a nearby little tea house and followed signs back to Shin-Kobe station. Right at the end of the walking track, there was a man who was surrounded by hundreds and hundreds of walking sticks which he was selling. Kate wondered why you couldn't just pick one up off the ground and I pointed out that in making all of his sticks he'd probably cleared the area of good sticks to use. I think he'd also engrave your name into the stick if you wanted. Our next destination was the Kobe Earthquake museum which was built in 2002 in order to commemorate the 1995 Great Hanshin Awaji Earthquake and to teach about earthquakes and disaster prevention. The museum is part of a larger Disaster Reduction and Human Renovation Institution complex and is located in HAT Kobe which is a relatively new area located to the east of central Kobe. To get there from Shin-Kobe we caught the subway to the central Sannomiya Station and caught a JR train to Nada station from which it is a 15 minute walk to the museum. There’s a closer station, Iwaya, which is located only a 10 minute walk away although since it’s on the Hanshin line we’d have to pay. Using the JR line with the JR pass meant we didn’t have to pay anything extra. Once we arrived at Nada we walked down to where the museum was located and found that there were a fairly large amount of similar looking buildings around the place. We managed to find the museum without too many difficulties though thanks to Google maps on my phone. After paying for our ticket we had to wait a few minutes until we could actually go in. This was due to the fact that the museum starts with an audio/visual simulation of an earthquake which starts every 10 minutes. Once it was time for the next show to start we caught the elevator up to the top floor and were led to a relatively small room that had no seats, but instead had spaces to stand behind little fences. The video was pretty dramatic and showed short actual video footage of the earthquake from different parts of Kobe. There were speakers used to simulate loud noises and big strobe lights that flashed to simulate electric flashes, fires and to add to the general commotion. There was nothing gruesome in the video and no people were visible although some of the clips included footage of things like train derailments and such, so it was still pretty upsetting to watch. Following the video we walked through a path that was set up to look like a destroyed, post-earthquake part of a city. It had smashed parts of buildings, houses, shops glass, traffic lights and so on, all twisted up and strewn all over the place. We were then led into another room that had seats to watch another (non enhanced) video. Since this video had dialogue we were offered headphones which had English audio, that played in time with the presentation. I didn’t end up using mine as the video had Japanese subtitles and was basic enough for me to understand. The movie ran for about five minutes and detailed the first hand experiences of a young girl who had lost the rest of her family during the earthquake. After that we went down to the next floor and started looking at the different displays. Soon after we started though, a man came up to us and started telling us things in English- he had an “English” sash on his arm. We didn’t really mind too much at first, but followed us everywhere to each exhibit and got really annoying! He didn’t really tell us anything that wasn’t on the English signs and it meant that we had to wait for his explanation rather than do things at our own pace. It was also unsettling to have him shadowing us everywhere. We decided to try and shake him off by going down to the next floor which seemed to be successful, until we saw him coming down after us about a minute later! There was one point where he was talking about us to another employee in Japanese and said we were “Brothers and Sisters”, I don’t know how he worked that one out as we certainly didn’t say anything about our relationship, I corrected him in Japanese and said we were girlfriend and boyfriend. We really just wanted to go around ourselves and ended up missing out on most things in our attempts to lose him. In the end we said we had to go and he followed us to the exit. We hung around outside until we saw him return back up to the higher levels and snuck back in to have a look at some of the exhibits we had missed. Since we were scared he'd see us we didn't stay for too much longer though. Next time this happens we'll pretend to speak German or something I guess. I took this photo in the herb garden, I'm not sure where though. Our final destination for today was another trip up the mountains, although this time we'd be going up to the top of Mount Rokko. A cable car services the top of the mountain and the bottom station can be reached by catching a bus from either Rokko (Hanshin) or Rokkomich (JR) station. Again, since we had the JR pass we decided on the JR line and walked back to Nada station. Since we didn't have our jumpers with us, and we thought it would be pretty cold on top of the mountain, we first actually caught the train back to Motomachi in the opposite direction. After retrieving our jumpers from the hotel we then hopped back on the train to Rokko Michi. Once we found our bus stop near the station, we waited a short while, boarded the bus and arrived at the Mt Rokko cable car station about fifteen minutes and two hundred yen later. Unfortunately a cable car had just left so we waited in a heated waiting room for ten minutes until the next one arrived, which we then boarded. While we were waiting I bought a hot cocoa from a vending machine in the waiting room. The journey up the mountain was steep and took a surprisingly long amount of time! We knew it would take ten minutes as that's how long we had to wait but sitting on the train for that long while it just kept going up and up gave us the impression that it was a pretty long cable car. When we were half way up the single track split into two as we passed the other cable car that was coming back down. After a total distance of 1.7km and an accent of 493 metres we reached the top! The views of Osaka bay from Mt. Rokko are one of Japan's three most famous night news and is known in Japanese as the view that is worth one million dollars. Honestly though, it wasn't that great. The night views of Hakodate we'd seen only about a week earlier were far superior and we actually even enjoyed the views from the Kobe Herb Garden more. It was by no means terrible though, the sparkling lights were very pretty but somehow felt like they were a long distance away. The facilities at the top were quite old as well and not as good as the ones at Hakodate either. To warm ourselves up we took out some heat packs we had bought at Nikko during our last trip to Japan. The heat packs are little sachets that, when opened, heat up due to some sort of exothermic chemical reaction. I've never seen them before in Australia and we had bought them as Kate's feet were almost frozen solid after walking on all the wooden temple floors barefoot in December. They're really cheap and a lifesaver during cold times! It was amazing to go into a conbini and find precisely what we needed without even knowing such a thing existed! The packs helped stop our hands getting too cold although since they were not as warm as last year I wondered if some of the potency had worn off. During the rest of our time at the top of Mt Rokko we took some photos and admired the, despite my complaints, perfectly wonderful views for a while before making our way to the cable car. Although it was not crowded at all on the way up, the trip down was absolutely packed! I guess everyone who had spent the day on top of the mountains was returning home. Due to all the people, we were actually pretty worried about getting on the next bus, and indeed it was mad rush to the buses once everyone got off. Thankfully we managed to get a seat and after arriving back at Rokkomichi we caught the next train to Motomachi. Before heading back to the hotel we stopped at the ticket gate at motomachi to book our trip to Tokyo tommorow. Since we'd pretty much done everything we wanted to in Kobe we aimed to book an early 6:51 train that required a change at Shin-Osaka. While we were waiting in line we same someone in front of use purchase an absolutly massive stack of tickets! It would've been about 15cm high! I have no idea what they were for (school group?) or how much it cost. When it was our turn I explained that we wanted to get a 6:51am Kodama to Shin-Osaka and then change to the 7:13am Hikari to Tokyo. At first he said that there was no such train, which worried me a bit, but he eventually managed to find it ok. In the past we had required a changed we were given two tickets, this time though he gave us a single compact ticket each that had both the train times printed on it. Once we had a tickets we left the station and went back to the hotel. I can't quite remember if we went out again to get dinner or not, or what we had, although I think we may have ended up getting something small at Starbucks. Tomorrow we'll be travelling back to Tokyo before doing a bit of unplanned exploration of the city! Annoying (and kind of funny) about the man at the museum following you to give you English-guidance. We've had experiences before with over-eagerness in customer service. I would guess it's a matter of being bored and a desire to feel needed. Yeah I can definitely understand if they don't normally get many English people coming through. We might've been the only English speaking people all day, or even week pehaps, to come through.